Taiwanese manufacturer Hannspree is best known for its LCD monitors and televisions, but also offers a small range of laptops and netbooks. 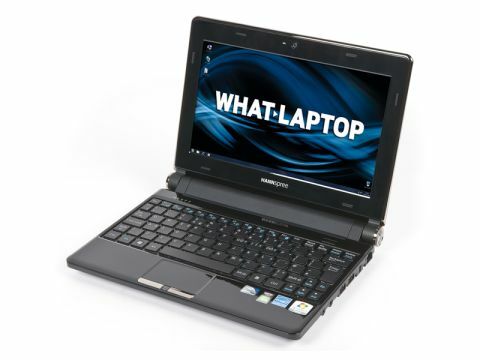 The SN10-E218 is a light and compact netbook which boasts strong portability and suffers from very few obvious flaws. Most netbooks offer rather limited performance, using low-powered Intel Atom processors and integrated graphics to cut down size and prolong battery life. This netbook is no exception with the 1.66GHz Atom N450 CPU running the show. Basic office tasks run fine, although some applications take a while to open and multi-tasking grinds everything to a halt. An integrated Intel GPU is in place and is acceptable for watching video and basic photo editing, but anything more complex is out of the question. The 10.1-inch TFT display is bright and sharp enough for prolonged working, and can comfortably be viewed outdoors as it is non-reflective. Performance may be limited, but the trade-off is extended battery life and in this respect the Hannspree excels. We managed to work for 469-minutes away from the mains, which is enough for a full day out of the office. The 1.3kg weight and 30mm-thick chassis make this a highly portable machine that can comfortably be slipped into most bags. The actual chassis is similar to that used for the Hannspree SN12. A glossy finish has been used for the lid and the interior and looks smart if unremarkable, although it will quickly attract dust, smudges and fingerprints. The chassis is solid enough to survive a few knocks on the road. The keyboard flexes slightly in the centre, although not enough to interfere with typing. An isolated-style keyboard has been used, which is unusual for a netbook, but it works well. The only drawback is the cramped nature of a few of the keys, such as the tiny Shift keys. The SN12's touchpad was hampered by tiny mouse buttons which were sunken into the chassis and hard to press. We were disappointed at first to see the same design used here, but the mouse buttons actually protrude fully and aren't awkward to use. The touchpad itself is highly sensitive and can be turned off by pressing a button just beneath it. Features are minimal, as with all netbooks. A 3-in-1 memory card reader is found alongside three USB ports and a VGA port, but there's no optical drive. The SN10-E218 is a well-built netbook with very few flaws. Portability is particularly impressive, even if performance and features are limited, and the asking price is just right.